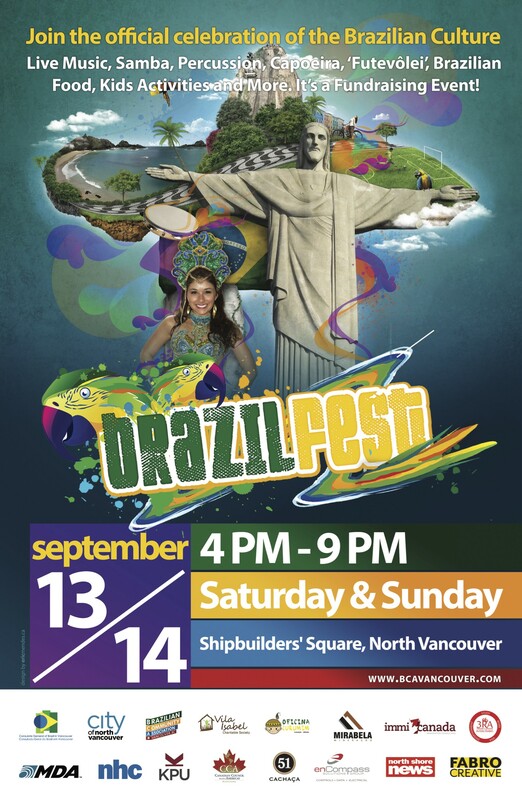 Brazilfest is an open-air festival that will take place at the Shipbuilder’s Square, in North Vancouver Saturday September 13th and Sunday September 14th, from 4 to 9pm. Previous editions of the festival were held in downtown Vancouver and attracted over 20,000 people. The festival is a Brazilian Community Association (BCA: bcavancouver.ca) initiative, supported by the City of North Vancouver and the Brazilian General Consulate in Vancouver (vancouver.itamaraty.gov.br/en-us/). The event is a fundraiser for BCA, Vila Isabel Charitable Society (vila-isabel.org), and Oficina Curumim (facebook.com/curumim). Brazilfest is a family-friendly event, attracting people of all ages interested in the vibrant and diverse culture of Brazil. With Brazil trending in so many areas of interest, with the World Cup just passed and the Olympics on the horizon, there is more interest than ever in Latin America’s biggest country and most booming economy. ‣ Children’s activities on the theme “Brazilian Fauna” conducted onsite by Oficina Curumim, a local Portuguese language school. Face painting, drawing, puppeteering, storytelling, traditional Brazilian children’s games. ‣ BCA Choir presentation in partnership with Oficina Curumim ‣ Brazilian music concerts, by Brazilian musicians residing in the province: Celia Enestrom and Zazueira; Celso Machado, Sambata. ‣ Footvolley (futevôlei): friendly matches showcasing this Brazilian popular beach sport. A tournament will be held open to the participation of anybody interested in giving this fun sport a try. Volleyball that you play with your feet, Futevôlei was created in Rio de Janeiro in 1965 to go around a new prohibition against playing soccer on the beach. ‣ Artisan and Small Business’ tents showcasing Brazilian’s products and enterprises. North Shore News is one of the sponsors of Brazilfest.